SHORT-LISTED FOR THE YABBA and KOALA AWARDS 2013, 2014 and 2015! Con-nerd deals with the pressure of school and family expectations in a down to earth, gently funny way-Bookseller and Publisher magazine. In only his second novel, the young Thai-Australian ticks all the boxes for a winning kids book a strong lead character, an easily identifiable story and a healthy dose of humour.- West Australian. It’s one small step for nerds, one giant leap to being cool! Mama tells me I’m gifted and talented. But I know the truth. I’m just a nerd. Kids call me Con-nerd-half Connor and all nerd. So what is Con-nerd all about? There’s this kid named Connor who is a nerd. Yep, he wears these mega glasses and kids think the only thing he’s good at is studying. Connor’s mum wants him to work hard to be a doctor. But what Connor really wants to do is draw crazy cartoons and gruesome dragons that fly off the page. Nobody knows about Connor’s special talent…until he falls for the cute Korean girl, Tori Kim. Beauty and the geek right? He doesn’t have a chance. Then Connor’s classmates discover his pictures. His new friends are going to tell him how to be cool if he keeps drawing. Connor gets a makeover that will change the way people think about him. Before you know it, the whole school’s reading his own manga comic called Fireproof Knights. Connor meets an arts teacher Mr Gale who gives him a chance to win a huge arts competition. So Connor starts a mission to win his mum’s approval and hopefully Tori’s heart. Does Connor have the desire to chase his dreams or is he destined to be a brain-throb? So where did I come up with the idea for Con-nerd? If you take a look at my photos, you’d probably notice that I’m a NERD. 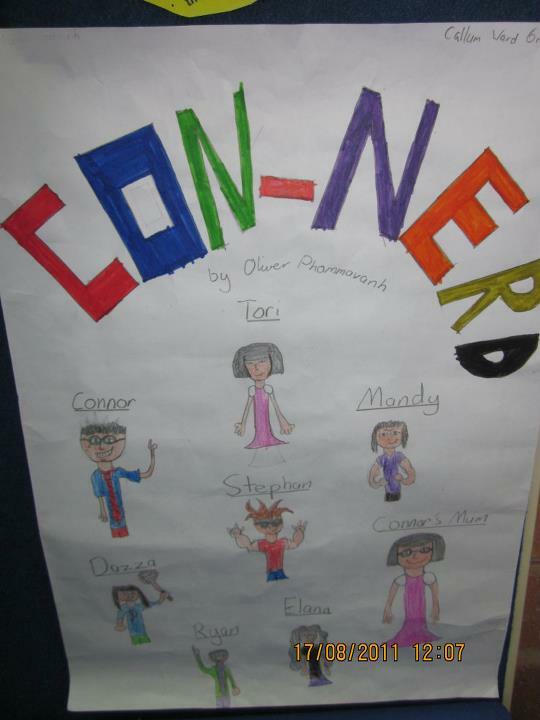 Connor goes to heaps of tutoring classes because his mum wants him to get into a selective school. My mum made me go to those coaching classes. I was under pressure to study hard and make it in. It was normal for kids like me to go to tutoring. Parents want their kids to be number one. I looked like a nerd but like Milhouse says, nerds are smart! I did alright at school but I was never going to get a perfect report card. I was never good enough for my parents and that feeling sucked. I hated being compared to other kids, who were child geniuses. I wanted to write a story about being forced to do something that you don’t want to do. It doesn’t have to be school work, it could be sports, music or anything else. I know parents mean well when they push their kids, but what’s the point? 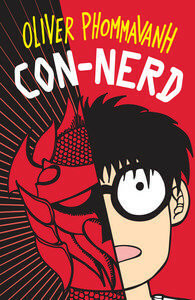 Con-nerd’s a story about discovering your own gifts and talents. I knew I wanted to be a funny writer back at school, even though my parents wanted me to be a doctor or scientist. I followed my dreams but it was harder to make my family proud. Connor has to find a way to make his mum understand. Trust me, it took ages and ages for my family to see what I wanted to do. I’m proud to be a nerd. Yeah, you heard me, there’s nothing wrong with being one. I wanted to write a story that many kids with glasses might face, such as making friends or er…having a crush on someone hehe. Connor tries to impress Tori and his friends give him a cool makeover. I had so many crushes on girls at school but I was too nerdy and nervous to do anything about it. So my friends helped me out too and it ended up in 2012 style disasters. Con-nerd has a few scenes ripped from my own diary of a geeky kid. Don’t worry. I’ve got enough embarrassing moments to fill at least 76 more books. 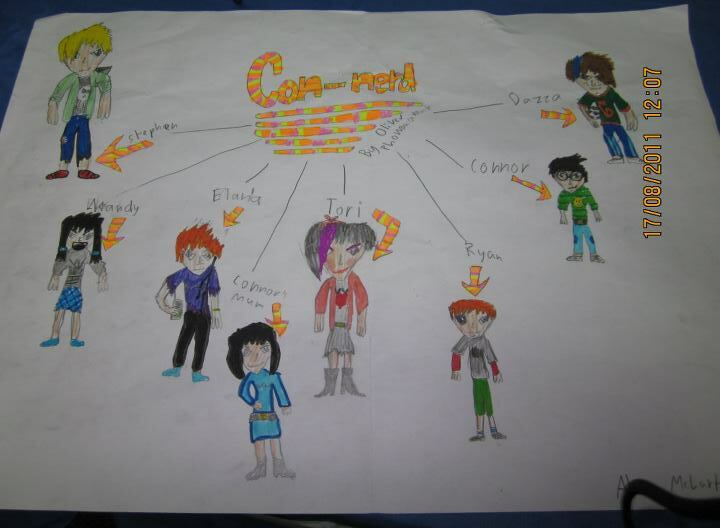 You’ll meet all these characters in Con-nerd! Cover was done by Evi O, who also did Thai-riffic! 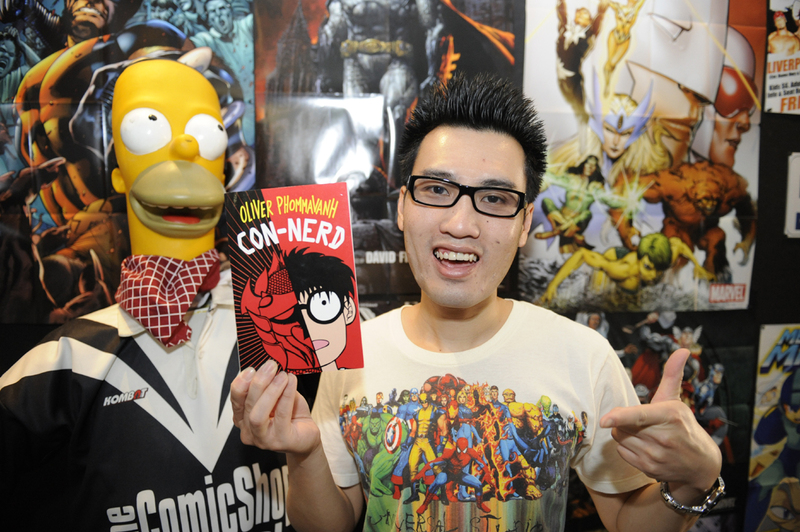 Meet some of these characters in Con-nerd! Connor’s a nerd who doesn’t have many friends. Okay, he doesn’t have any real because he keeps quiet at school. He spends all his lunchtime in the library, learning how to draw in his secret sketchbook. Connor wants to make his family proud by studying hard at school and tutoring classes. He’s hoping to make it to a selective school and pass his entrance exam. Connor loves drawing cartoons in his spare time. He wishes his whole life was one cartoon hehe. 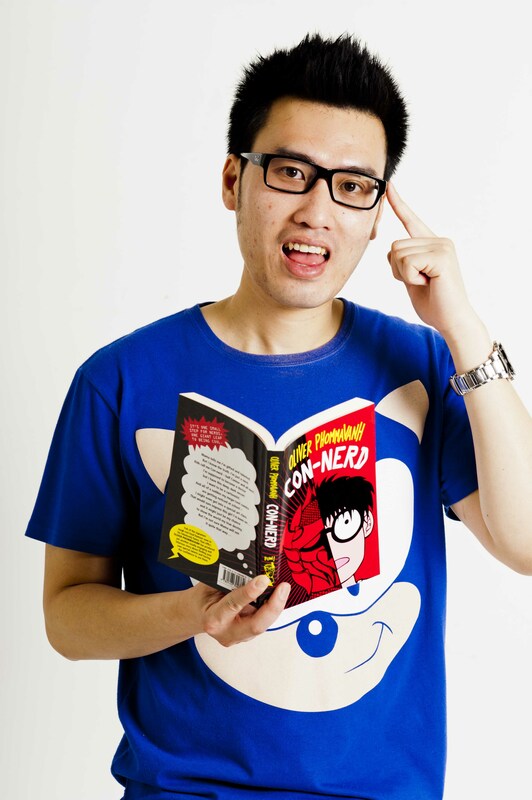 He also loves reading comics and manga too. He’s a little shy around others and tries hard to please his mother and teachers. But deep down inside, he wants to show the world his drawings. He has this wicked idea for a manga called Fireproof Knights. He’s that quiet guy in class who you don’t know exists until he gets a quiet achiever award. Tori’s a sweet Korean girl who’s just moved from Korea. She’s a confident and brilliant artist who likes drawing portraits. She’s a kind-hearted girl who steals Connor’s heart and is always cheering for him, whether it’ll be for his art or basketball skills. She’s always thinking positive! Mandy is Connor’s neighbour and the closest thing he has to a friend. She’s been sticking up for Connor since they were in Year 2. Mandy’s one tough nut, she doesn’t take any garbage from anybody. That includes Connor, who’s always getting punched by her, but in a friendly way haha. She always has her i-pod plugged into her ears and has a major crush on Jason Bobo, a hunky pop singer. Mandy loves her star signs and reads horoscopes in her magazines. Mandy tries to help Connor out in his makeover with her fashion advice. Mandy’s the sister that Connor never had. She’s not afraid to take it up to the boys too. Stephen is a troublemaker with a short attention span and a knack for annoying teachers. He thinks he’s the coolest kid at the school. He’s a buffed up guy who loves wrestling, playing sports and gets around on his Rip Stik board. Stephen also likes his comics, so he’s interested in Connor’s own drawings. He wishes he could draw like him. Stephen become Connor’s newest friend, daring Connor to ask Tori out. He helps Connor out by introducing him to the best hairdresser around. Stephen’s based on a kid that I had in class, he’s easily distracted and doesn’t stay seated for more than 5 minutes at a time. But underneath all that coolness and tough persona is a heart of gold. Dazza’s a sporting whiz, playing everything from rugby league to basketball. He’s known for his woolly hair that looks like a lion’s mane. Dazza is Stephen’s best mate and becomes friends with Connor too. Dazza’s likely to be on a footy card in the near future, he’s reliable and very easy going. Ryan is in Connor’s tutoring class and tries to be friends with him. Their mums are friends and Connor’s mum loves Ryan’s ever-growing list of achievements. So Connor doesn’t really like him that much. But then Connor finds out that there’s more to Ryan than meets the lens. He may be a high achiever but Ryan’s really just a normal kid, who loves public speaking. Elena’s the school captain of the school (along with Blake but he’s just there for show haha). She’s extremely likeable and loved by everyone at school, especially Stephen haha. She manages to be smart and popular, an all-rounder really. Connor reckons she would be prime minister someday. She’s also the boss of the Hot Spot magazine, the kids’ newsletter at school. Connor’s mum is a nurse and wants Connor to be a doctor. She makes sure Connor has everything he needs…to study study study. She wants Connor to honour the family by working hard at school. She cares for him and thinks she’s only looking out for his best interests.